One of the most requested features we have had to date is the ability to access the Signing Savvy website on mobile devices. First and foremost among the requests have been for the ability to access the site on the iPhone, which to date does not support the Flash-based video we have on the standard website. We are happy to announce that we now have a beta version of the Signing Savvy website available for iPhone and iPod Touch! The beta version supports nearly all Signing Savvy features including searching, browsing, flash cards, quizzing, and more. The only things not supported is printing (there is no printing from the iPhone anyway) AND the ability to view "combination videos" as a single video. That is, on the standard website, phrases and fingerspelled words are shown as a single, combined video even though they are actually made up of multiple videos. On the mobile version, phrases and fingerspelled words are shown as multiple videos rather than a single video. We hope to resolve this issue in the future. The beta version is currently available exclusively to our Signing Savvy members. Note, this is not an "App". Just direct your Safari browser on your iDevice to https://www.signingsavvy.com, login (as a member), and enjoy. We are exploring the possibility of expanding the Signing Savvy mobile access to other modern mobile platforms that support web browsing and video playback. Stay tuned for future announcements. I'm so glad to hear this news. I have an HTC Snap Windows Smart phone. The vidoes do display correctly, but the search box is in accesible. The phone is what I have with me whenever the arises to look up a sign. We really need the ability to search quickly...especially in an interpretation situation. This is good news! I am using the site right now on the brand new iPad that arrived on my doorstep this morning. The site works great! Signing Savvy with video optimized for iPhone, iPad, and iPod Touch is now available to all visitors of the site using one of these iDevices, not just members. Obviously, members will enjoy all the added member features when mobile BUT all can access the basic features. I have a droid from T mobile and would love to be able to access this site from my phone. what about the nexus three sixty?????? I use sprint, and I would really like to get this site on my phone!! Keep working on it!! In case anyone is using Windows mobile, I have been able to access Signing Savvy on my phone for quite a while now. If you have Opera's latest mobile browser (don't know about free version) it may work. I have an ATT Fuze and I can search using the search field and see the videos pretty well. If I zoom or move around, the videos can have trouble getting straightened back out, but it is very usable. I work with a child who is hard of hearing in the school system, so it is fantastic for me to have a word come up in class and quickly be able to show her what the sign is for it! We appreciate this resource a lot, thank you. Signing Savvy should technically work on the latest Android OS (which supports HTML5 video.) However, we don't have an Android phone so we have not been able to test it. Please make it work for my Droid! From all of us at Signing Savvy, we wish you a very Merry Christmas and a Happy New Year! While we worked for several years developing the site before it went live; the beginning of 2010 marks the end of our first year of being live on the Internet and we are very grateful for the support of all of our users. We particularly are thankful for full members who allow us to continue to grow the site. 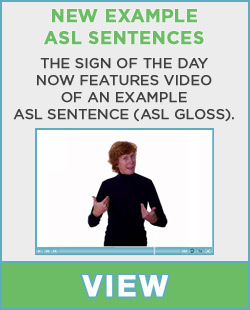 In 2010, we will continue to expand the dictionary of sign videos and add member features that will aid you in your sign language learning. Right hand with 4 fingers against the left forearm bent, fingers aimed up and brushing up toward face. trying to figure out sign??? My daughter and I are learning sign language just for fun and use your site frequently to learn new vocabulary. Thanks so much for creating your video dictionary. Thank you for your great website, you all did a great job. John can you add to Signing Savvy the ability to search for a sign by description, resulting in a display of several possibilities. Thank you for your email and I wish you a safe, happy, prosperous New Year. I am so glad this website is here! Just wondering what state signingsavvy is based ? I live in California and I noticed that some signs are very regional. Signing Savvy members now have the ability to turn off advertising if they wish. You can do so by changing the preference within your account settings. Learn more about the many premium members-only features on the about page. We try to make our many features as easy to understand and use as possible, BUT we know more explanation for some of our features is long overdue. We often get questions such as how do I create my own word list? How does the phrase builder work? How do I setup virtual flash cards and quizzes? How do I print multiple words on the same sheet of paper? To address this, we have made a series of screencast recordings! We hope this set of videos will better explain our features so you can take full advantage of site. The videos are available by clicking the "i" icons in the About Section of the site or you can check them out on our YouTube Channel. Several videos are up ... but we are still in the process of adding captions. Captions are on a few of the videos but we hope to get them on all the videos within the next week or so. It's encouraging to see the changes and additions you are making. Thanks and congratulations. you all kind of need to add "cross" as in he died on the cross because i am learning to sign a song for church and i am using your website to look up words in the song and i could not find "cross" anywhere even a synonym. but with this website my friends and i have learned several inspiring songs from getting help from this website. thanks! We now have captions on all the videos. Enjoy! I can't view your video dictionary, the gent showing how to do the words, on my I-phone; I-phones are NOT compatible with Adobe Flash Player (apparently because of a stalemate between Adobe & Apple). As I’m sure you’ll understand, it is extremely likely that Signing Savvy members might need to refer to your site when not at home. Can you find a second method with which we can view your videos? Many sites give a couple of options for just this reason.